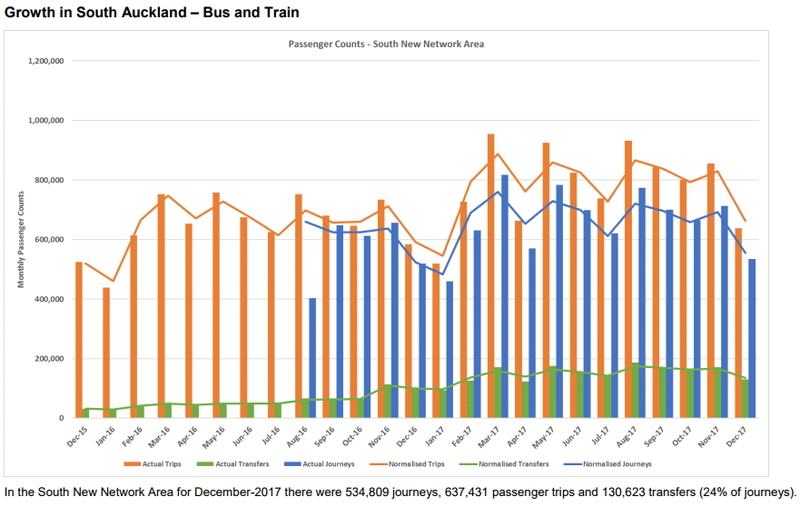 The December ridership numbers from Auckland Transport are out and there is one particularly surprising, albeit understandable result. Overall, ridership in December grew by 3.1% which is not the highest it has ever been but growth none the less. One of the key reasons for it being lower is that there was one fewer working day compared to December 2016. But that wan’t the only reason and I’ll get to the others shortly. 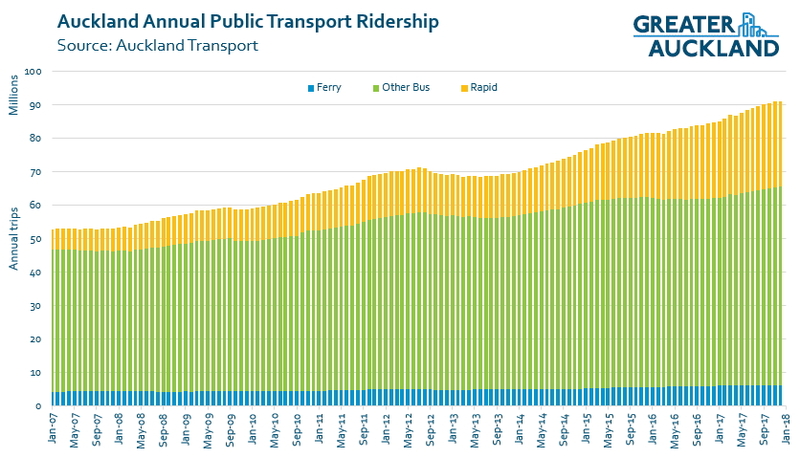 Bus numbers are continuing to show some good growth and as I’ll discuss later in the post, a lot of that seems to be from areas with the New Network rolled out. Ferries also saw a bit of growth which is being driven by Fullers commercial routes of Devonport and Waiheke. The surprising aspect was that for the first time since April 2013, rail use dropped. As mentioned, there was one fewer working day in the month. The rail strike on December 8. Over the last year we now average over 70,000 trips a day on the rail network, although less in December due to Uni/school holidays and then the Chrismas to New Year period. The two fewer days of trips quickly adds up to being a significant impact. All up and including the lack of special event trips, AT estimate that after normalising for the impacts rail growth would have been 5.6%. That’s still a lot below the double digit growth of a few months ago but similar to November. Whilst there is clearly still some underlying growth in rail usage, I think it does highlight that it has slowed down recently. It makes it even more important that Auckland Transport focus on getting rail frequencies up to frequent standard of at least once every 15 minutes, 7am-7pm, 7-days a week. This is doubly important given rail is meant to be the backbone of the new bus network. Speaking of that new bus network, there appears to be strong growth in the areas it’s been rolled out. Here are some highlights from ATs reports. The Southern network rolled out at the end of October-2016 so we’ve now getting our first year on year results. 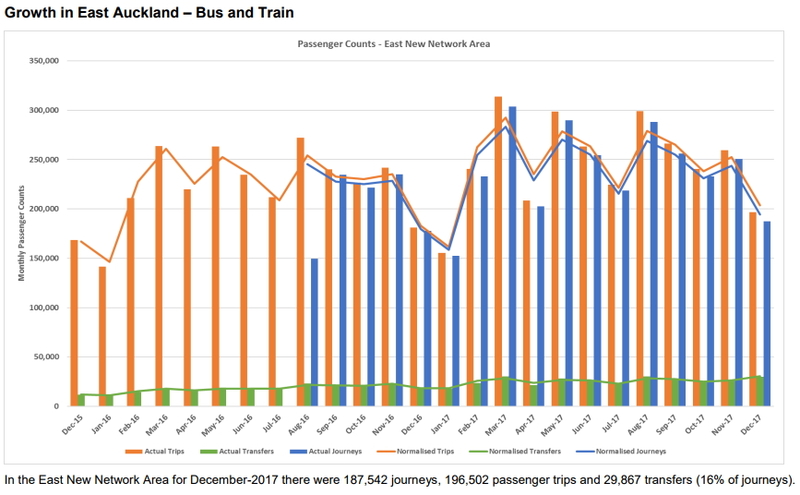 After normalising the results, overall trips increased by 12% and even if you take into account that more people are transferring, the total number of journeys is still up by 7%. 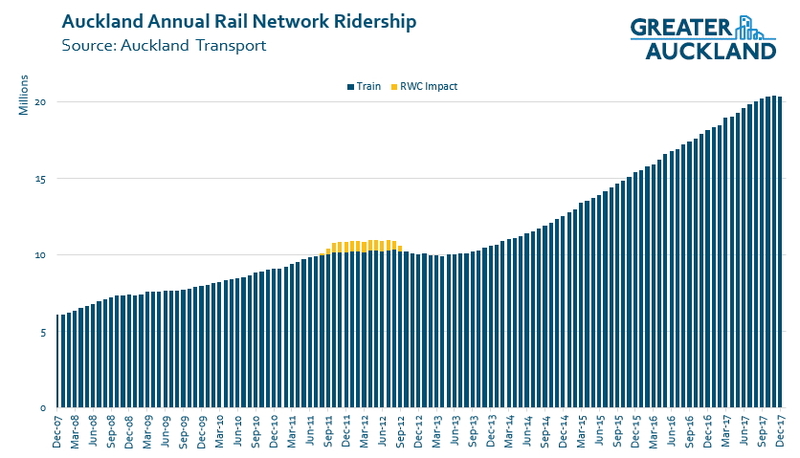 The Eastern network only rolled out in December but is already showing good progress. 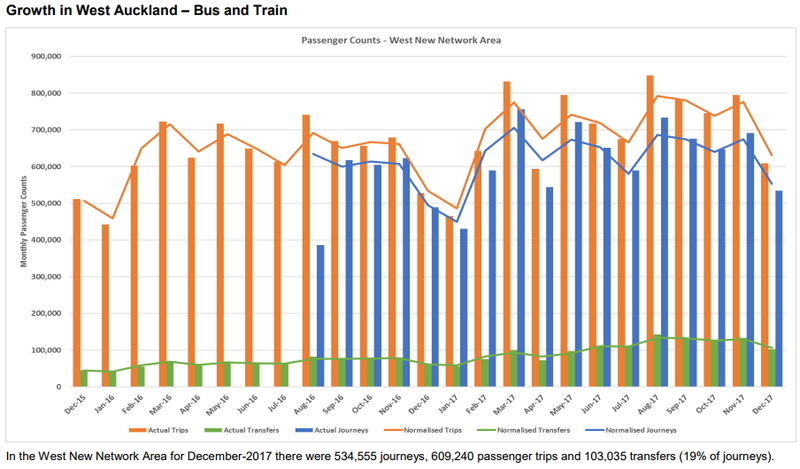 Normalised trips in December were up 11% with total journeys up 5%. Given that overall bus numbers, even after being normalised were up 5.6%, this suggests that the central and North networks saw lower growth numbers. Historically, the isthmus has made around 40% of all bus and train usage and the North around 20%. Those two networks are scheduled to roll out later this year and if we were to see similar results to above, we’re going to see some rapid growth in PT usage. It doesn’t help with rail patronage when AT decides to close the Southern Line services on Anniversary Weekend, when a lot of people would be looking to use the train to come into and return from town. My son wanted to get to Pukekohe by train and was left feeling very frustrated because these delays and cancellations to this service keep happening. AT seem to ignore users that would like to have rail as a reliable service outside of normal working weekdays – there is huge growth to be had in this area if it is managed properly. I like taking trains but if I have to wait half an hour minimum for one on a Sunday I will take the car instead. And the Western Line. Mind you they had rail replacement buses operating. Rail Replacement Bus, three words that strike fear into every commuter. Yet another reason why the rail strike should never have happened. Striking should only be used for safety issues or as a last resort for pay etc. In such an important sector as rail transport there really needs to be a 3rd option as the disruption caused is too great. At the very least more notice should be required so that all available buses can be pressed into service to help. Just because you might disagree that removing train managers is a safety issue doesn’t mean the strike wasn’t about safety issues. Anyway, as a more general remark… it strikes me that extending the latest train is something that needs to happen. As I said once before here, the old Papakura-CBD bus route/s used to run later than the current trains. As a consequence entire journey options have just vanished from Auckland as a result of the new network. (Tricks like 33 to 321 also don’t run much past the trains.) Either bring those bus routes back for “after” hours or run trains then. The former is probably easier. Hell, you could even do rail replacement services for this kind of journey. I’d also love to see increased frequencies during the day but let’s be honest here, other people are already saying this a lot so no need to elaborate. The rail strikes are about safety and AT mismanagement that requires severe cost cutting. Watch for further decreases in patronage if TMs are withdrawn and passengers find out that there is nobody to help the disabled or the elderly or somebody involved in a medical emergency. Or if there is nobody to assist when the train or the people in it are attacked. I strongly suggest that AT and Transdev are taking a huge risk here. They are replacing TM with transit officers and increased staff at stations. Both of which can do more than a TM who had no powers around security. Most other countries with far more successful metro rail do so with only a driver or often driverless yet they seem fine… what makes us so special? TMs were effectively a make Work scheme and not a cheap one at that. 200 transit officers to cover trains, buses and ferries. Why will Transit Officers be on buses? They already have an onboard staff member. I don’t know Jezza – that is what AT says will happen and, to them at least, they are always right. I doubt they will be on buses and ferries in the short term. The job description will just include this to allow for future scenarios on say the Northern and future Eastern busways where there is all door boarding with hop readers on the platforms. I think trains would be the huge focus but an occasional random visit of transit officer pairs on buses/ferries could be a good idea to deter any antisocial behavior, assist users, cheer up users or as a check that some bus drivers are not letting on users for free (though bit of discretion on this is perhaps wise anyway). Perhaps on certain routes at certain times (late night buses?). It could provide a good set of eyes for the “vibe” of how things are going that could be feed back to AT. Occasional biased bus driver or passenger feedback not give the same picture. Dozens of metro systems all over the world operate without them. I am sure Auckland will manage. The ironic part is they are planning on replacing TM’s with a far superior transit officer solution in terms of safety. But I guess the Union will use the ‘Auckland is different to other cities’ line, just as opponents of PT investment do. Wow – 24% of trips in the Southern Region have transfers. That is an amazing stat. Hopefully that is more people having less overall ‘perceived’ wait time with the improved frequency of the feeders and main trip. Is there any indication about the timelines AT have to gradually work towards the 15 minute frequencies (on weekdays first, then on weekends)? AT need to sort the rail frequencies out ASAP. It’s getting ridiculous now. 3 years since 10 minute all day frequencies were put in the RPTP. Any idea what process AT uses for assessing how successful they were in meeting the aims of the various documents, including the RLTP? When an aim like 10 minute frequencies has not been achieved, I’d have assumed the follow up would be something like investing more to make sure it is achieved over the next three year period. I’m guessing but a shortage of drivers, at least, is preventing better services. I have heard they’re quite skinny on numbers for current services as it is. Are they leaving to Australia for better pay and conditions? Someone’s mentioned before in a comment. That would be a sad situation to keep training more only to lose them again. Our rail asset is being wasted due to lack of frequency and span. Yes they were going to Aus. And part of the problem is yet again housing/ rent affordability. It is also a combination of a very prescriptive, predictable job (you drive on 3 lines and two short branches, day in day out) with utterly illogical dire shifts. There definitely could be more done to retain staff. +1, if the problem is retaining and training drivers they could offer more pay. I’d drive the trains for $250,000 a year, for other people it would be lower. Why is there so many cancellation and delays in the rail network. It seems like every other day there would be a train problem which AT has no back-up plan on. Either fix the source of the problem so it doesnt come back again or have a proper back-up plan to transport people in case it happens again (and I 100% know it will happen again). Australian cities have good back-up rail bus system which takes effect pretty quickly when unexpected things happen… why cant Auckland? The trains require major overhaul because they have been wrecked by our appalling track. Cancellation has to be managed properly. However, I was in Melbourne Feb 2016, It was shocking there too. Train stopped at one station than long waiting time for the bus transfers. Morning commuters has to come back home, It was that busy and badly managed without notification. If workers withdrawing their labour in protest makes AT’s stats look bad, then maybe AT should take workers’ concerns more seriously and they wouldn’t have to strike. They lose a day’s pay. No worker strikes for fun. Yay, race to the bottom! Lets kick out those dang humans fouling up the system! Yep, those “I’m okay, stuff you” comments are sadly not unusual. Thing is TM’s could do a secondary role of revenue policing in conjunction with the few inspectors they have, nothing major but just that knowledge that someone is always on a train checking tickets. That would save millions! and TM’s would pay for themselves then. But for reasons only best known to the geniuses at AT, they took that role away from them. Well those geniuses seem to know what the geniuses who run every other metro system I have ever been on know, train managers are not needed. Why is Auckland so special that they are needed? We are a low crime city, especially violent crime. Why are CCTV and people to assist at major stations not enough? Jobs change, deal with it. Give the TMs a decent severaance package and offer them preferred entry to transit police training. I think AT know what everyone else knows, one TM checking tickets would be next to useless, anyone evading fares could just move elsewhere in the train. If you go anywhere else in the world you will get teams of TOs that board a carriage and ensure everyone is inspected, including those that don’t want to be. SB, You sure the nightsoil men aren’t required? 🙂 The homeless around here (“moved on” from the cbd) leave quite a mess. And those tiny houses we’re going to block the rat-runs with will need something along those lines. Maybe composting toilet portaloo services… but it’s the same thing by another name. Nightsoil men, isn’t that what our harbours are for? Auckland is in competition with Australia and especially Melbourne and Sydney. In business, culture , lifestyle, wages, tourists etc. Businesses and people can easily migrate. So if our water is polluted, our rates of imprisonment, suicides, road deaths are high or we have high road congestion costs or lack of transparency in our local and central governments then the draw of Melbourne, the worlds most liveable city will win. Auckland’s CBD especially and other business areas are very important to the NZ economy and must be made more attractive and desirable to all residents. If people move to Melbourne or Sydney because of Auckland’s water pollution, high road congestion costs or lack of transparency in local and central governments, they are going to be severely disappointed. Media or in train platform announcements was woeful and they were over it. They’re back driving in which is very sad. Yes. Sad, and very frustrating. Yes sad. But wait now holidays are over. Big time motorway snark ups already.